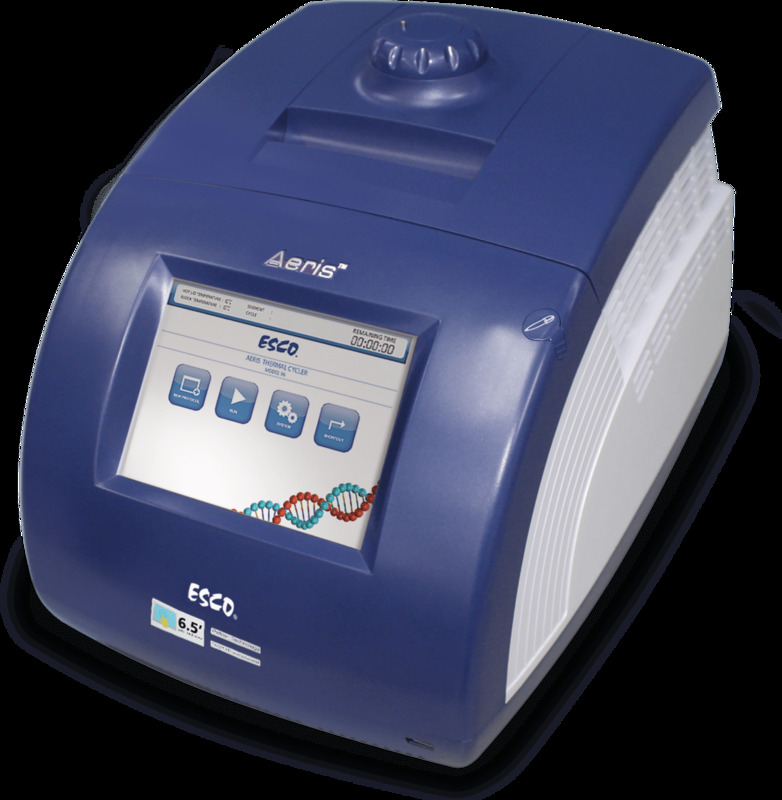 Aeris™ is the 3rd generation of thermal cyclers in the Esco PCR family over the last 5 years. It carries the proven reliability of Swift Maxi and MaxPro Thermal Cyclers. With the newly developed software functions, controlling the whole PCR protocol is now more user-friendly so that you can achieve optimized PCR result. Furthermore, the intuitive color touch screen gives you a new experience. The Aeris™ Thermal Cycler offer 5 interchangeable blocks designed to meet critical requirements for different applications: it suits a variety of consumable PCR tubes, strips, plates, and slides. AeonStar™ peltier is qualified to deliver outstanding and precise performance and unique IsoHeat™ temperature control technology, which delivers high heating and cooling rates with excellent temperature accuracy and uniformity. SmartDrive™ automatic block recognition increases user convinience. Aerislink™ software enables the remote control of up to 30 individual units via one PC. The Peltier module, electronics, and sensors are precision tuned and tested to ensure the longest operating lifespan possible. Pre-programmed methods provide easy choice. Large memory stores up to 250 individual methods in equipment, with unlimited methods on USB memory stick or PC. Multiblock capability with automatic block recognition software minimizes the need for manual settings. Automatic restart saves set points and resumes process in the event of power interruption. Password protection guarantees secure system access. Adjustable hot lid temperature and ramp rate. Powerful software that meets a variety of experimental requirements, such as Touchdown PCR, time release PCR, In Situ PCR, and others. PC management software that allows you to control up to 30 Aeris™ thermal cyclers via one PC. Industry-leading warranty for peace of mind. Best uniformity (≤0.2°C) and accuracy (≤0.1°C) ensure reliability and excellent performance. With the intuitive color touch screen, program setting becomes easier and faster with available functions to define different applications. Self-testing provides more detailed information, like different sensors and heating and cooling status. This ensures reliable performance will be achieved before the actual run in 3 minutes. Shortcuts can store regular programs, which can speed up the setting time. Allows running of ‘Long PCR,’ a new technique that applies to amplification of PCR. It is also able to run ‘Nested PCR,’ which allows users to have two pairs of PCR primers to reduce the contamination in products due to the amplification of unexpected primer binding sites. ‘Pause’ function with timer can easily be set manually. Suitable for many series of reagents and consumables, which can simplify experiments. Three language choices (English, Chinese and Spanish) on the control system for ease of use by operators worldwide. Adjustable backlight for operator comfort, making it suitable for different working environments. User log can store information for up to 20 experiments, which includes time and date, duration, program resuming time, power interruption, and program status. End users can make sure the test result is valid before doing the end point analysis.